Flashback to 1998... I had just relocated to Portland, Maine. My first job in Maine, working at Dunkin Donuts. I will say it was the perfect job. I was working the 9pm-5am graveyard shift at the drive-thru and helping out the baker with decorating and filling donuts. I was able to work alone all night, uniform consisted of my phish shirts and a Dunkin Donuts hat or visor, and the best part was the ability to take weeks off for tour and random traveling. 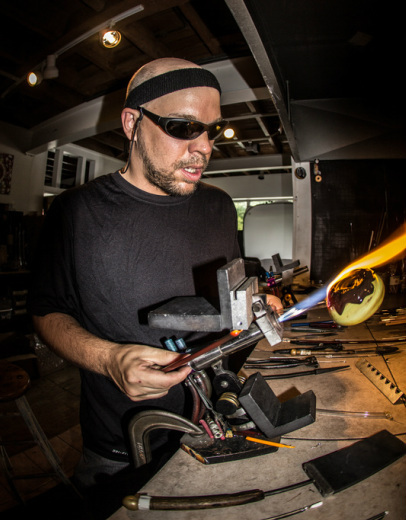 At those shows I was meeting a plethora of like-minded, phun, talented people, some of which were glass-blowers. I would go to VT and visit my new glass-blowing friends and watch them work, these were the people who gave me the first introduction to my passion for glass. As the years went by my baking position was outsourced and I was out of a job. I got jobs baking at some local bakeries, delivering pizzas and whatnot, trying to squeeze time in on my torch whenever I could. But, I was hooked on glass so I finally made the plunge and became a full time glass artist. When I was given the chance to move into Royal River Glass Studio , I pounced. This undoubtedly was a major turning point in my life and the life of the donut. 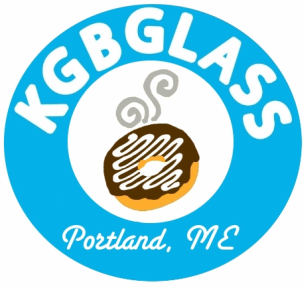 I was now exposed to creative, innovative artists that would help support and shape my views on glass and the glass donut. Since then i have worked with countless artists that have helped me along this journey.I now work out of a glass studio in Portland,ME, sharred with my longtime girlfriend Sarah Marblesbee. I am beyond thankful for all the love and support I have gotten over the years. Each day is a new donut and I am honored to be able to share them with you all.